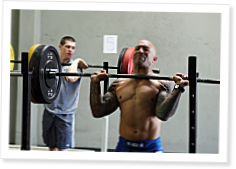 This is the 23rd episode of CrossFit Radio, which aired at 6pm PST on January 21st, 2009. Freddy talked about Freddy’s Revenge and Oly lifting at CrossFit One World, being 43 years old, his diet, and of course, the CrossFit Games. The next show will be Friday, January 23, 2009 at 6pm PST. The interview will be Tony Blauer from Blauer Tactical. This is the 10th episode of CrossFit Radio, which aired at 8am PST on November 23rd, 2008. This is the 47th episode of CrossFit Radio, which aired at 6pm PDT on March 23rd, 2009. No kids? All this genetic potential going to waste. I think the top ten XF games winners should have to make a "genetic donation" to the XF community either as a kid or in the "other" kind of bank.